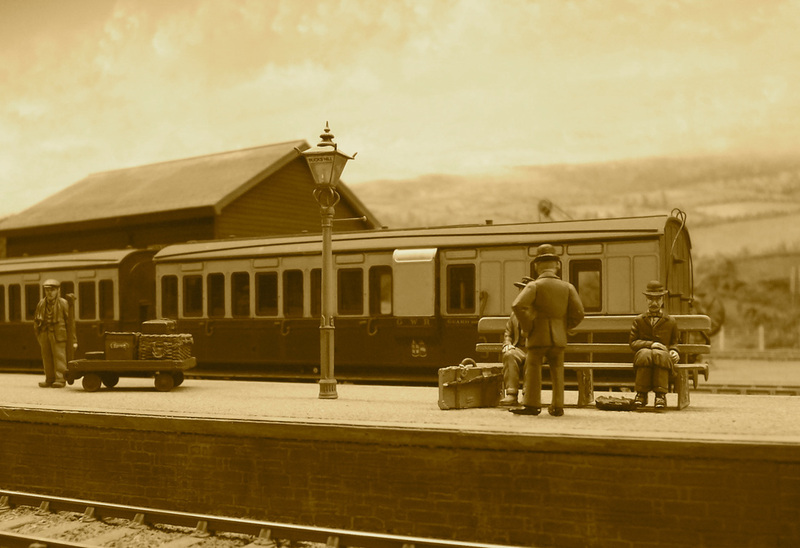 It’s a pleasant pastime to just sit by the lineside and watch a few go by. All these feature Alan Harris cast iron wheels, but a variety of builders and specialists have played their parts to create this photogenic collection. I’ll let the captions cover the details and add a short description of the locality for those readers not familiar with the layout. De Glehn compound No 103 'La France', with illustration below. 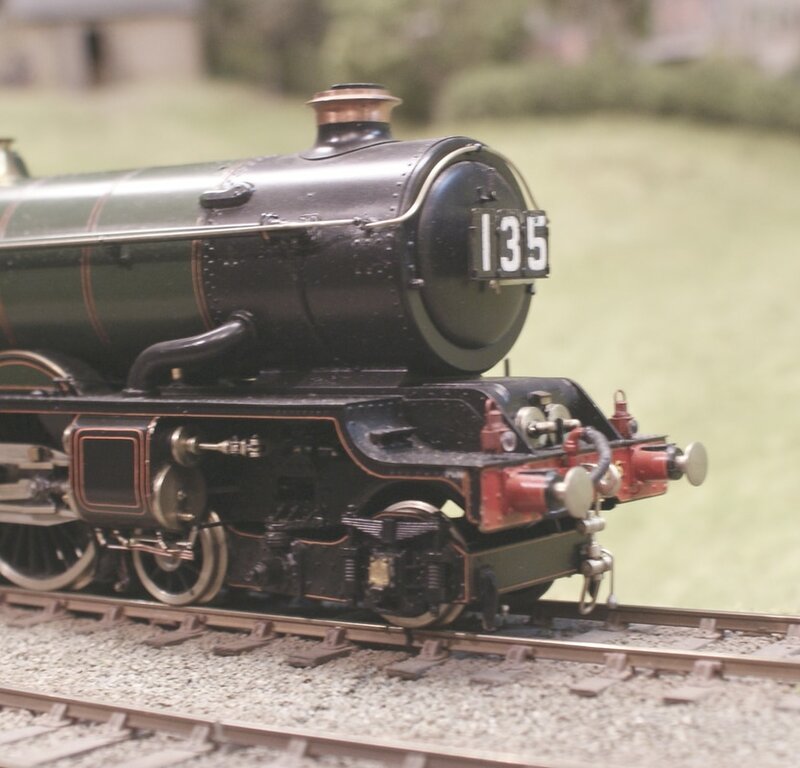 Scratchbuilt Mike Brierley King is a historic collector's piece from the era of Beeson and Norris. Resident Dean ‘3232’ class 2-4-0 waits to back onto a short van train in the yard headshunt. Dean Goods with colliery wagons. 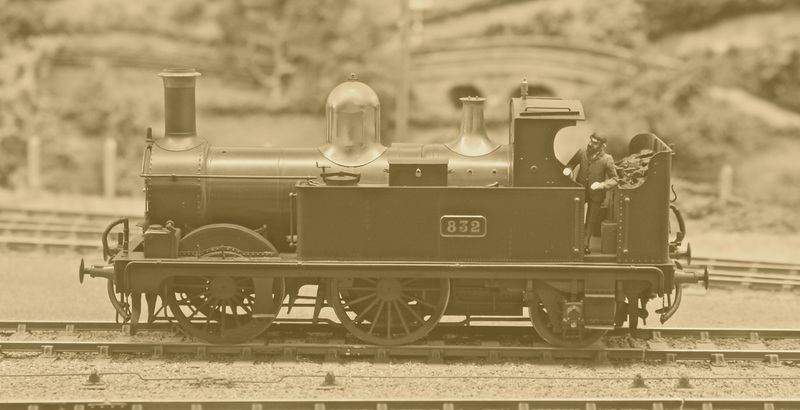 Dean 2-4-0 No 3242 was one of a class of 20 fast passenger locomotives built in 1893. 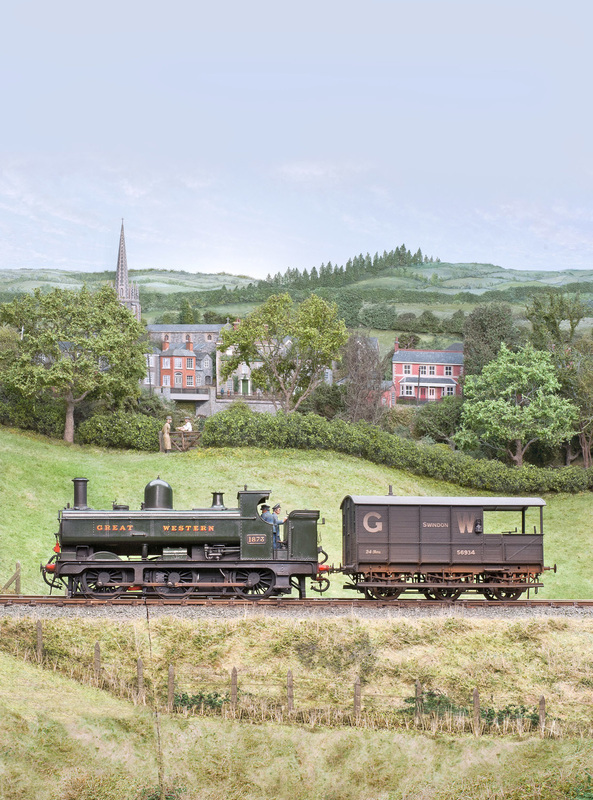 They worked Swindon to Weymouth trains, South Wales expresses, (as seen here) and other fast North to West trains. A few were shedded in the twenties at Machynlleth and Oswestry, often fitted with Belpaire fireboxes and later boilers. Original by Chris Nevard. 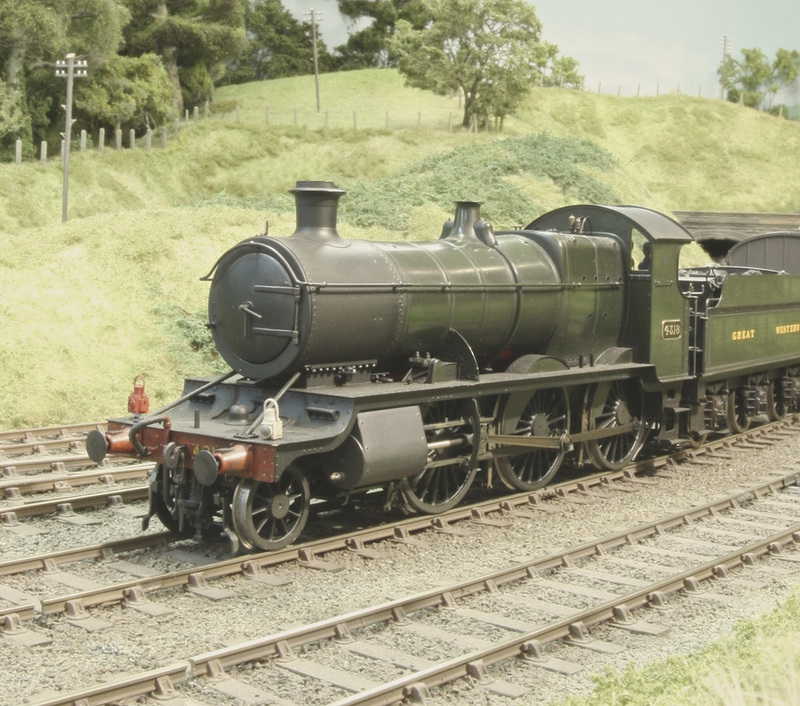 This fairly recent addition to the stud is a BR Class 4MT 2-6-4T, and it's also an MOK build. 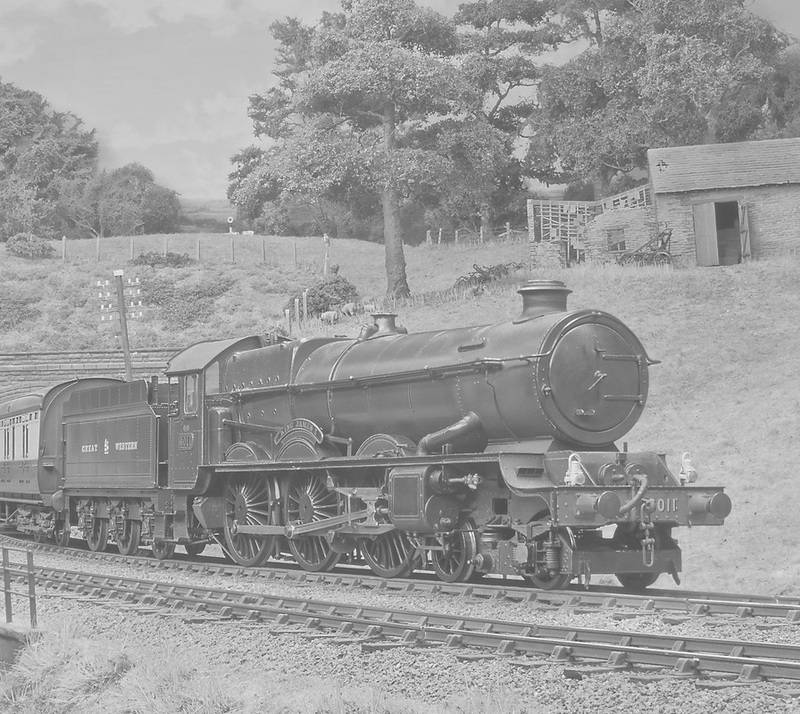 The original survives at the Bo'ness & Kinneil Railway near Linlithgow on the southern shore of the Firth of Forth. 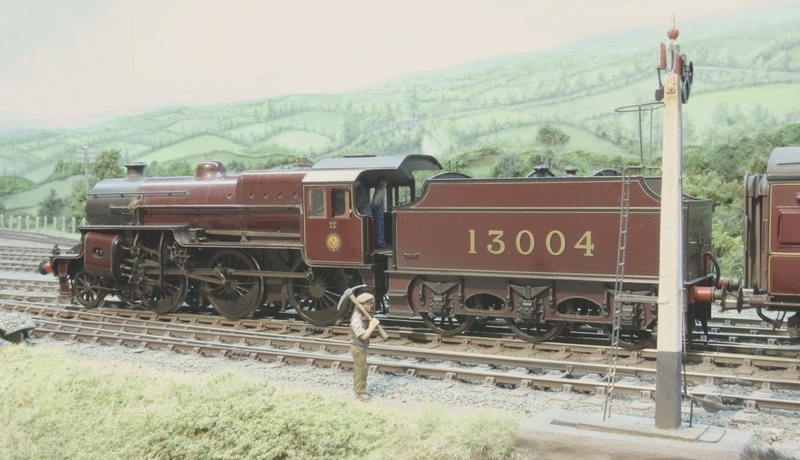 Unrebuilt West Country No 34098 'Templecombe' rounds the end curve with a Southern bogie brake van. 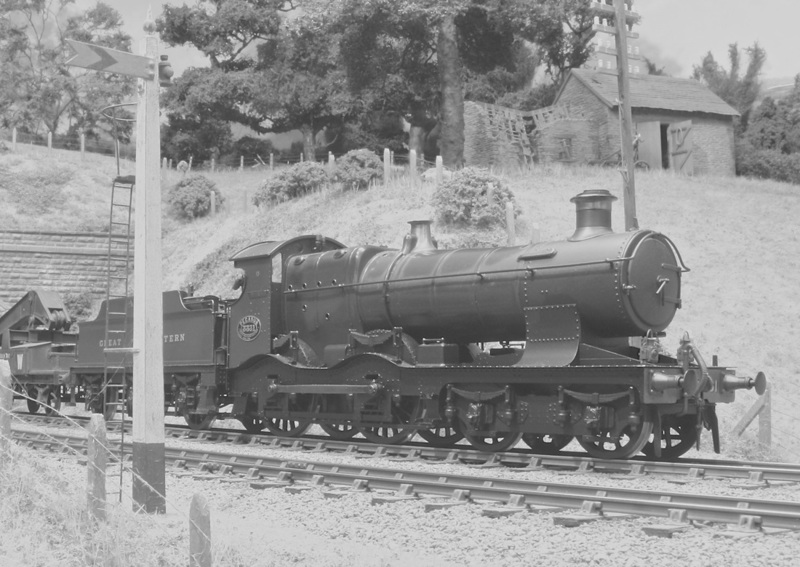 The loco never wore Southern livery, only coming out of Brighton Works at the end of 1949. 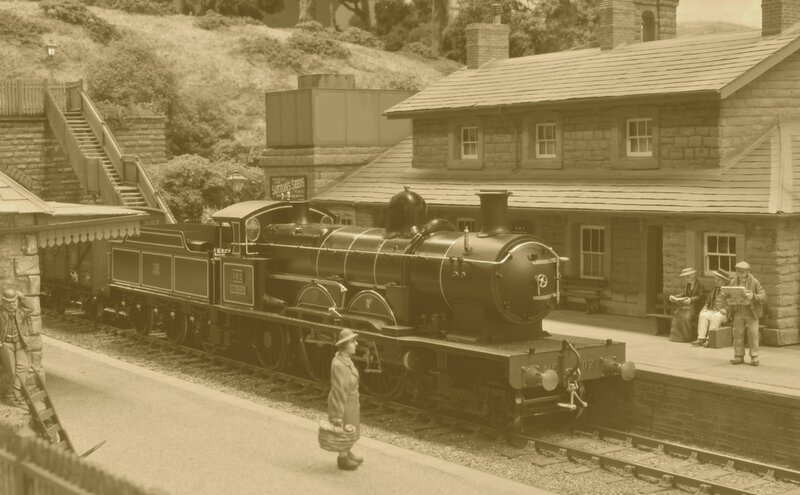 My build of the MOK Ivatt L.M.S. 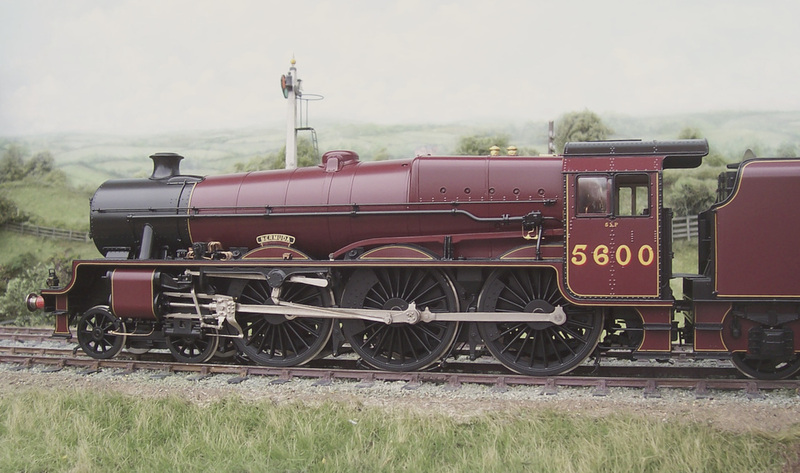 Class 4 kit, seen here as 43059, which was built along with the other 162 in the first few years of BR. 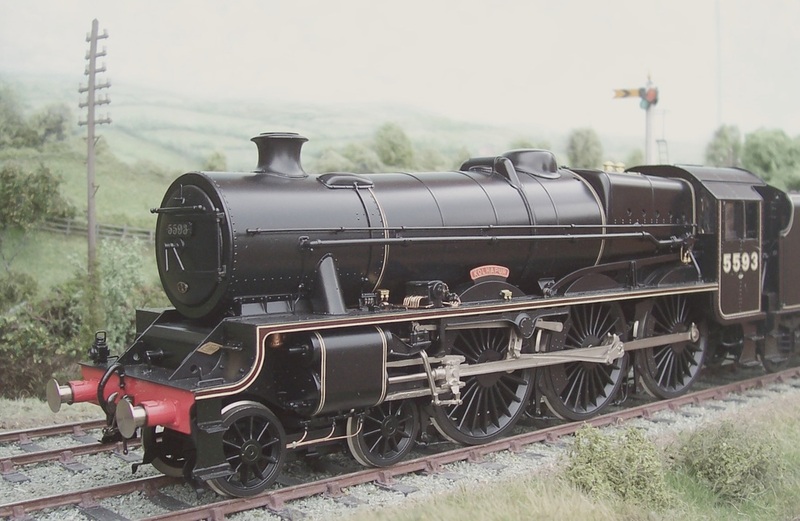 There were 53 of these iconic Patrick Stirling 8ft Singles with their marvellous perforated splashers like paddle steamers, and no 1 runs with an appropriate train of G.N.R. six wheeled teak carriages. 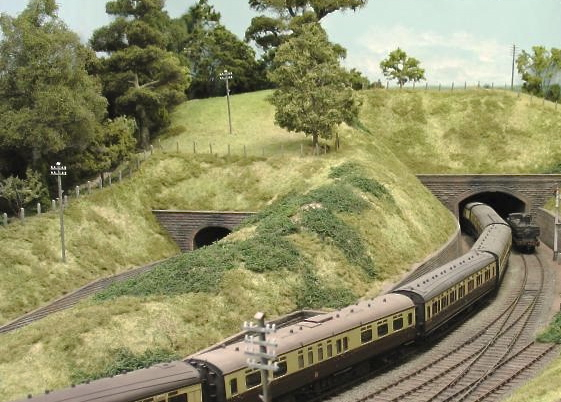 They were designed specifically for high speed expresses between York and London and succeeded in averaging nearly fifty m.p.h. 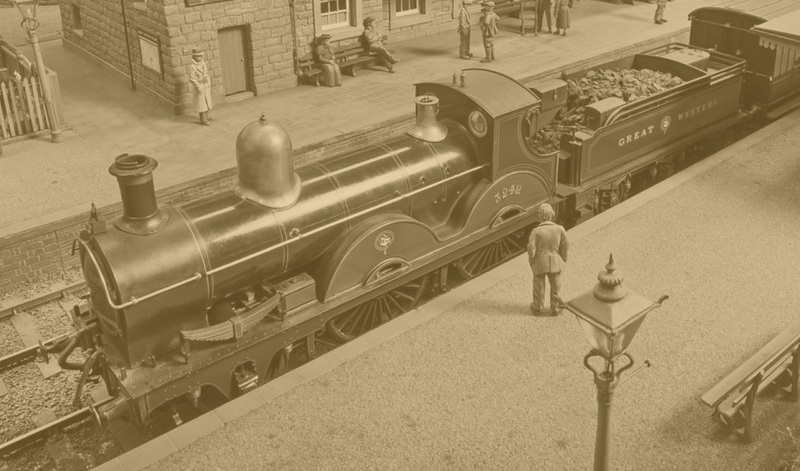 As the turn of the century approached, the G.N.R. 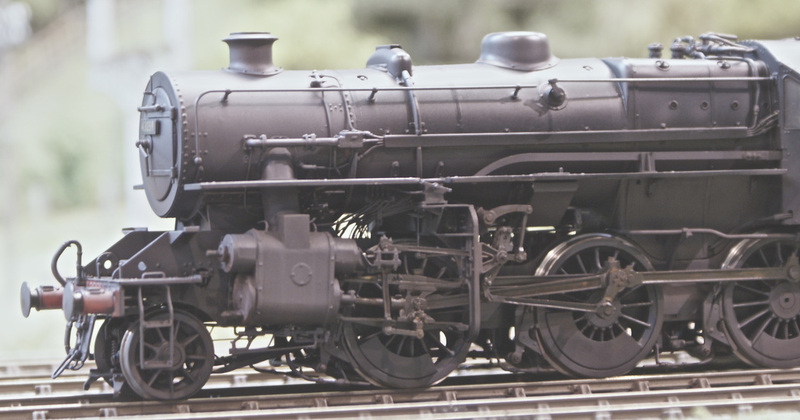 and their competitors found newer four-coupled designs to be superior. The loco was scratch built by Simon Hill with AGH wheels and Portescap motor. Simon retained an example and the pair were painted by Alan Brackenborough who upon completion of the lining stated he wouldn't do another! 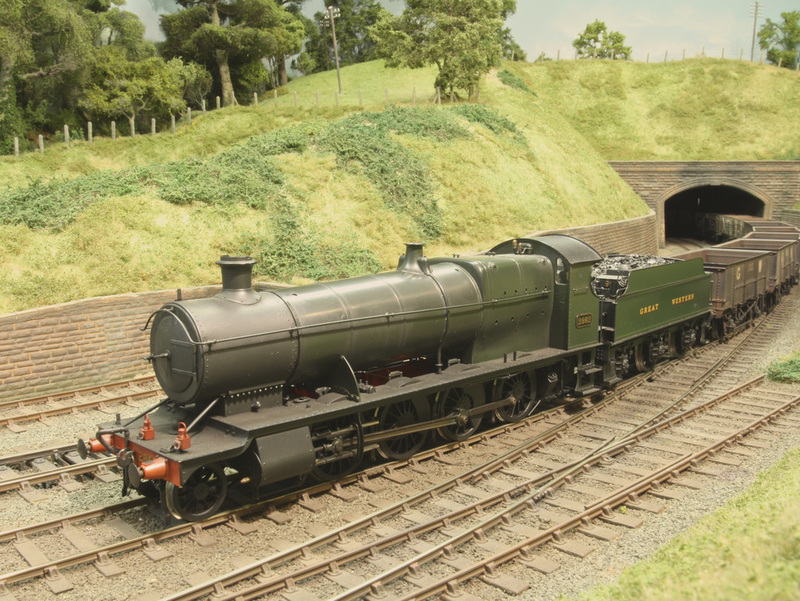 No 6011, ‘King James 1′ in the original 1928 condition, runs along the embankment with an up express. 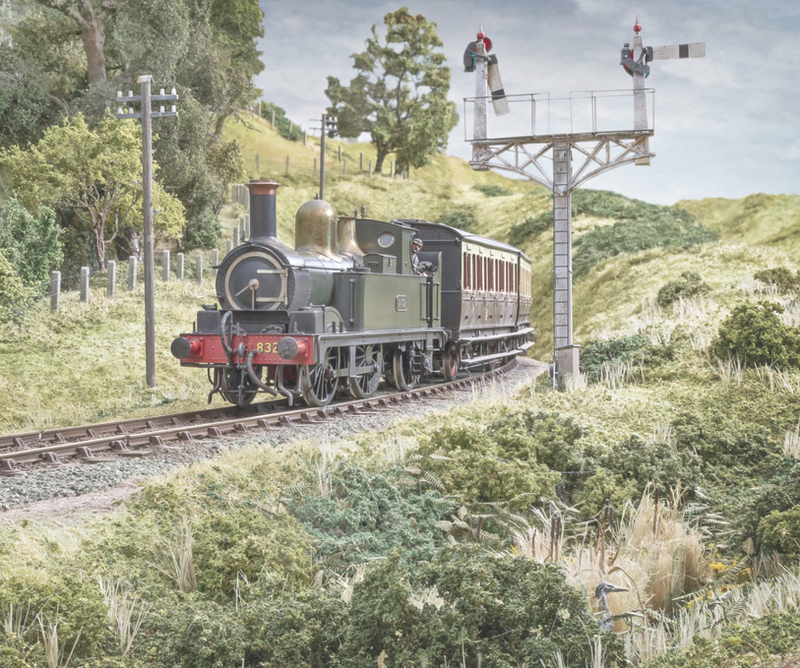 Original by Steve Flint/Railway Modeller. 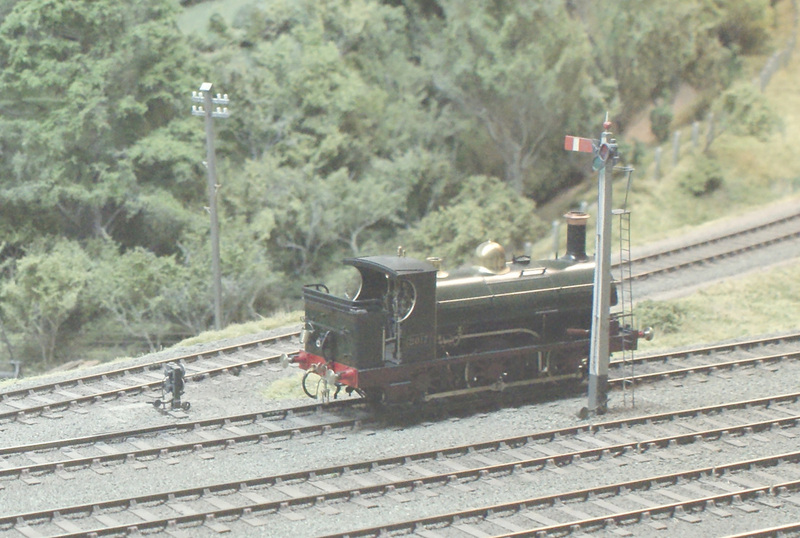 No 976 slows to a stop at Bucks Hill. 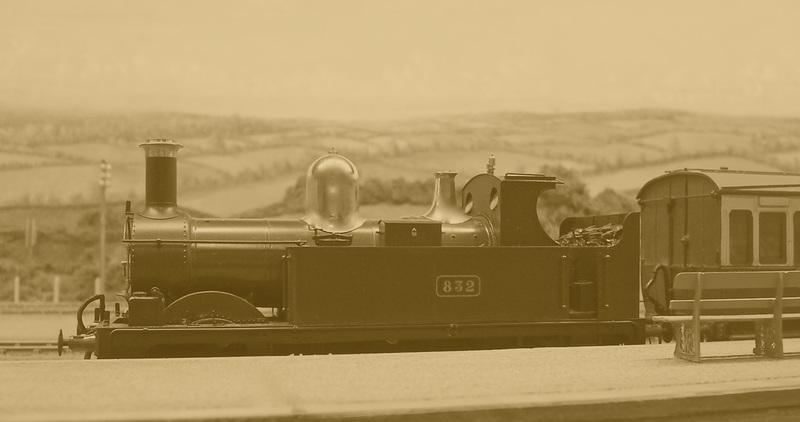 Some of these 1874 Armstrong designed 455 class ‘Metro’ tanks were kept at Swindon, Oxford and Gloucester after their spell in London’s tunneled lines, while others were also seen in South Wales and in the West of England too. 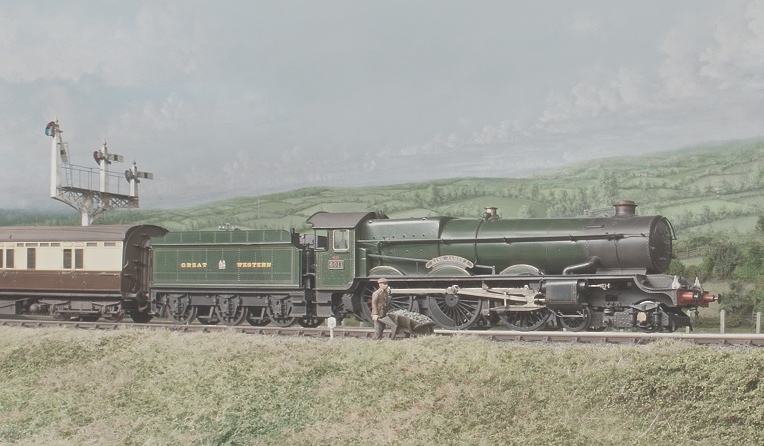 They sometimes hauled main-line trains like this Cardiff to Gloucester cross country service, being capable of remarkably fast running on the open sections. 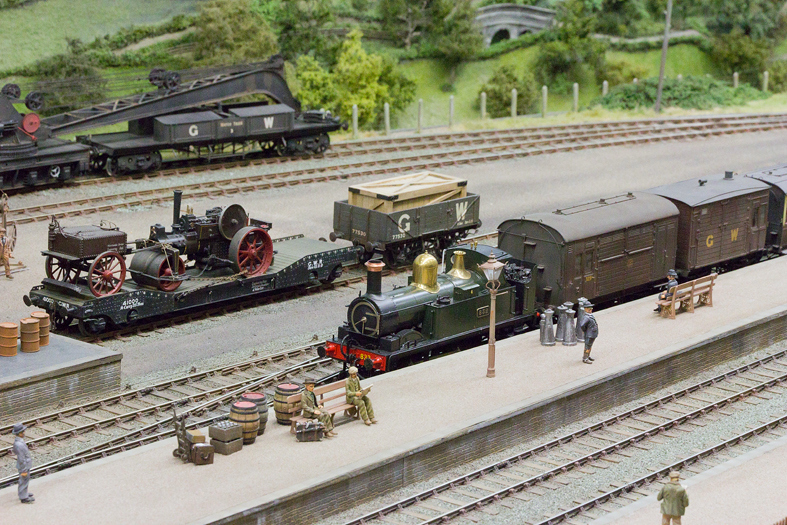 Original by Steve Flint/Railway Modeller. 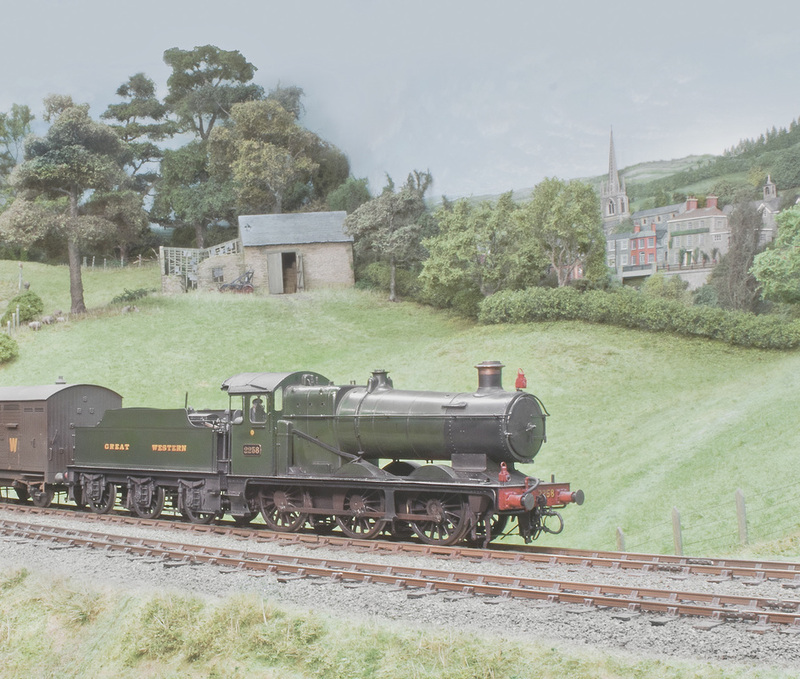 My lined black Patriot class 4-6-0 No 5538 'Giggleswick' is a regular runner and it heads up with an express formed of pre-grouping Wolverton bogie stock. 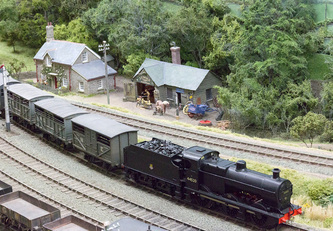 The branch line locomotive shunts the goods yard before its next turn back to Hay-on-Wye. Dukedog 4-4-0 No 3267 'Earl of Plymouth' brings a van train onto the down main. 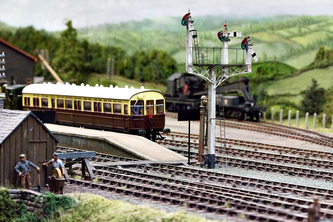 Original by Steve Flint/Railway Modeller. Mogul No 4318 on the down main. 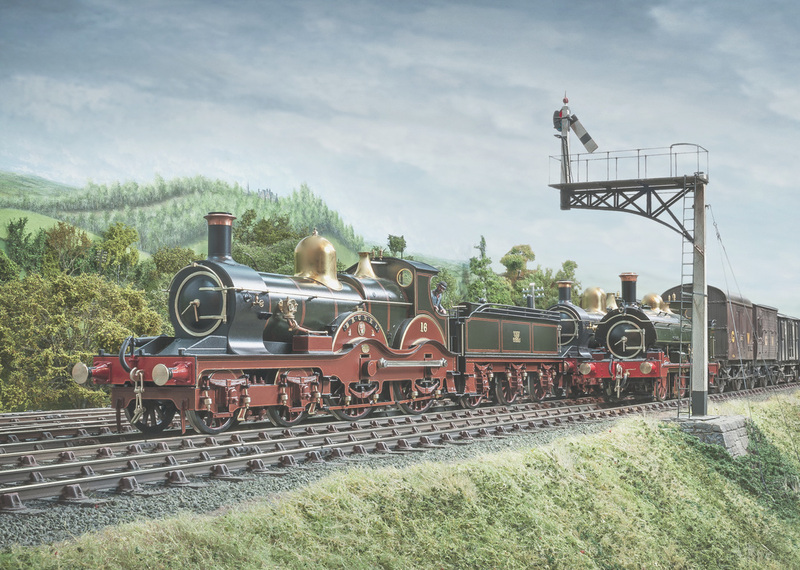 These numerous mixed traffic locos were first introduced in 1911, with standard number 4 boilers and the frame support struts similar to those fitted to the '2800' class. 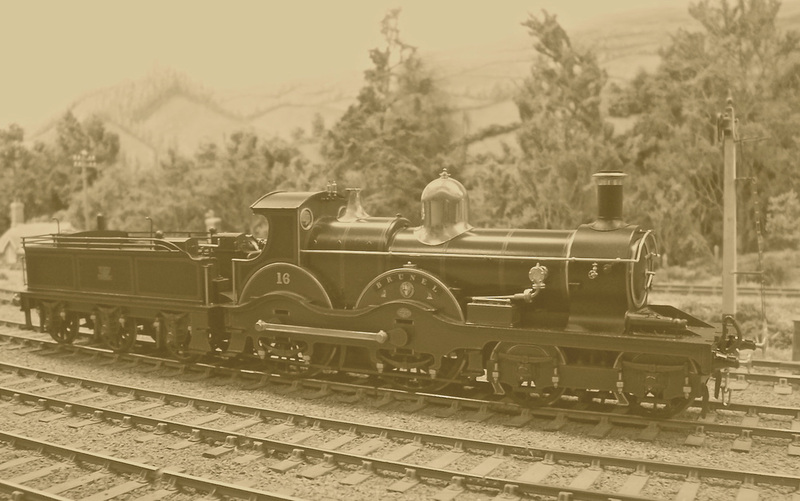 Sepia study of a 517 Class locomotive as used on the Golden valley branch line. 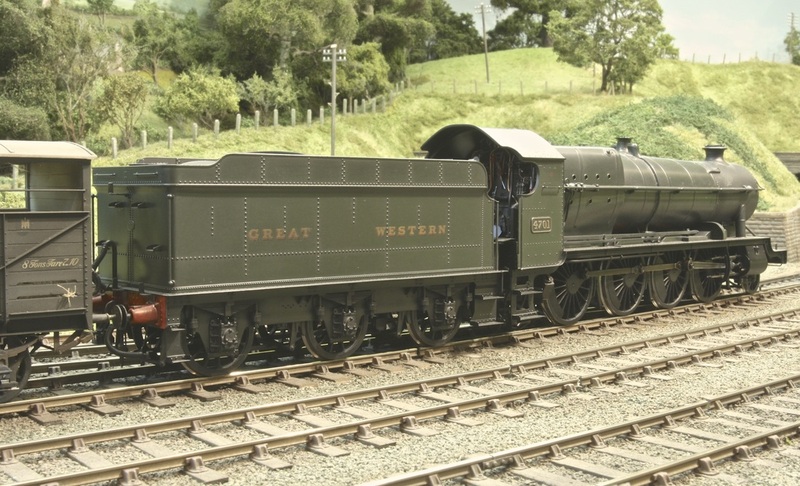 No 832 was an 0-4-2T designed by George Armstrong for local passenger work on the Great Western Railway. 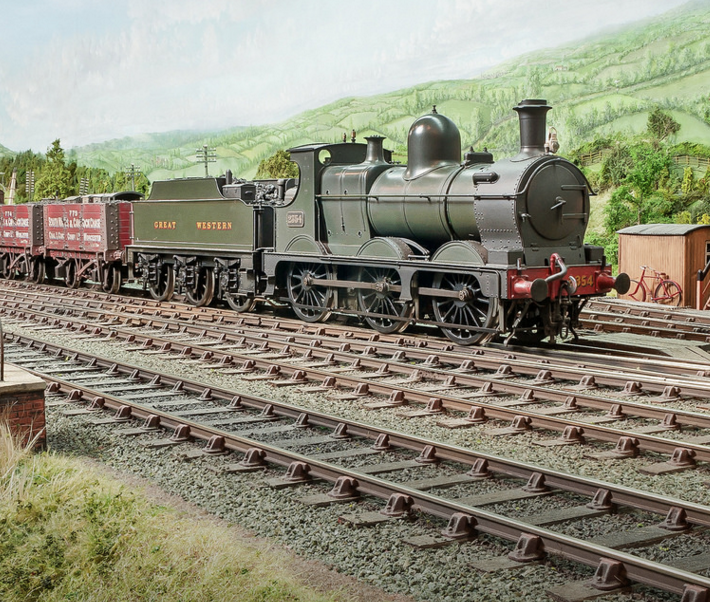 They were built at Wolverhampton Works and this particular one was outshopped in 1873. 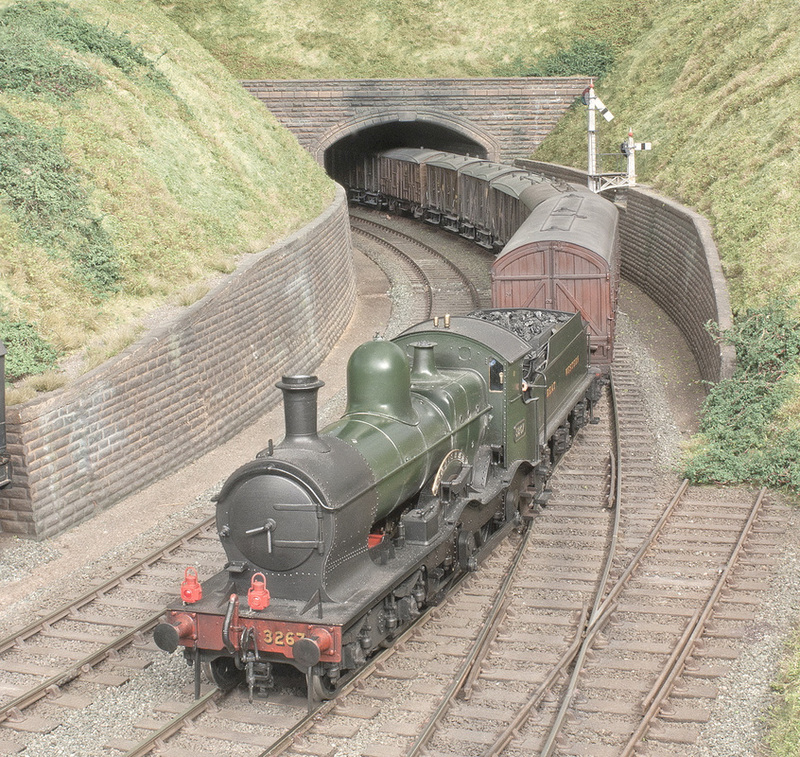 No 2258 approaches Bucks Hill tunnel with a van train. 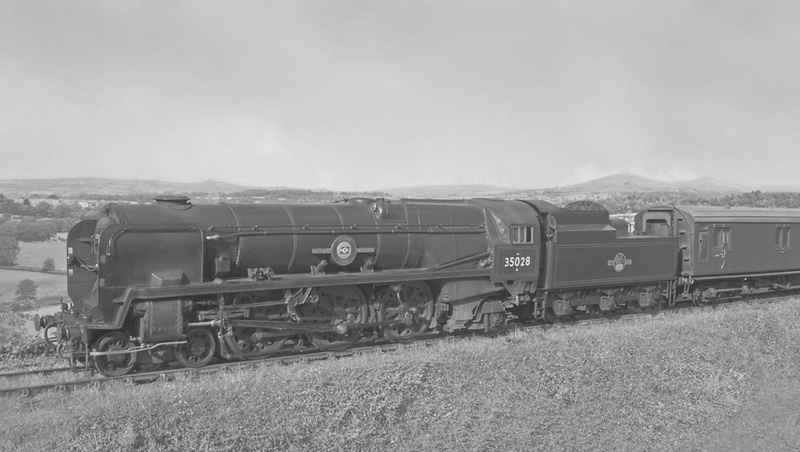 120 of these Collett 2251 class 0-6-0s were built at Swindon, as first introduced in 1930, designed for medium goods and some branch passenger work. 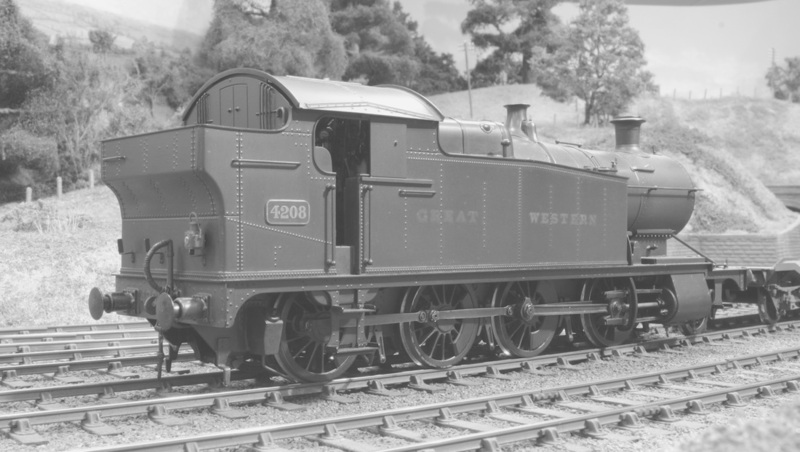 They were really a modernised Dean Goods, sharing the main dimensions, but with more modern features such as taper boilers and full cabs. 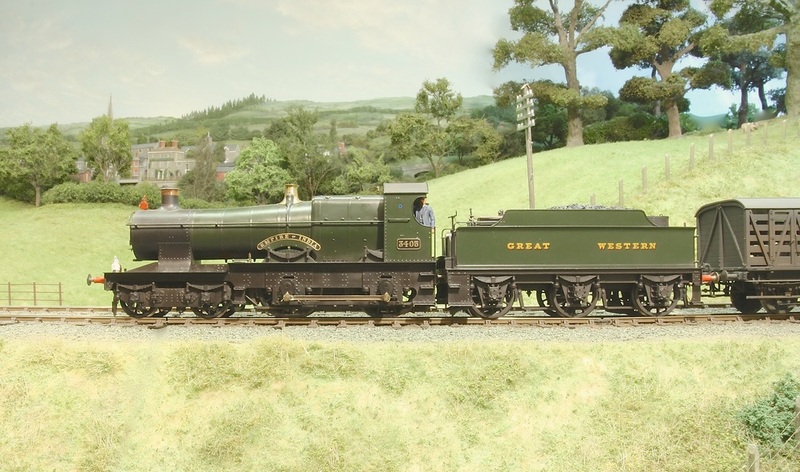 This one was finished at the end of April in the first year of production, and is seen here as only a few years old. 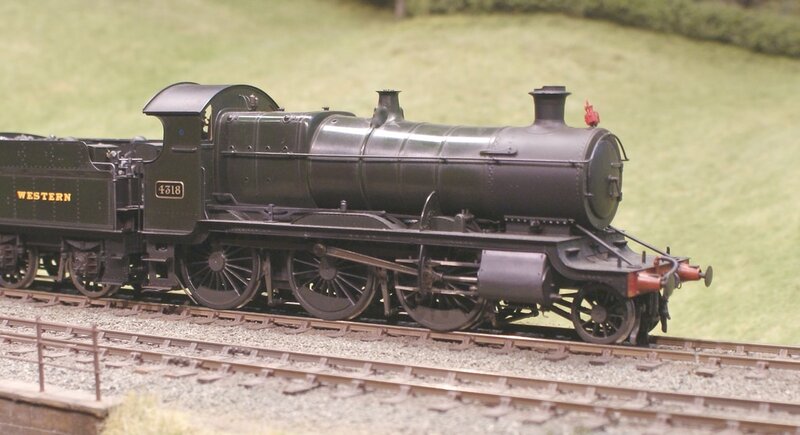 Built from a Martin Finney kit, also using the Finney inside motion parts. Original by Steve Flint/Railway Modeller. 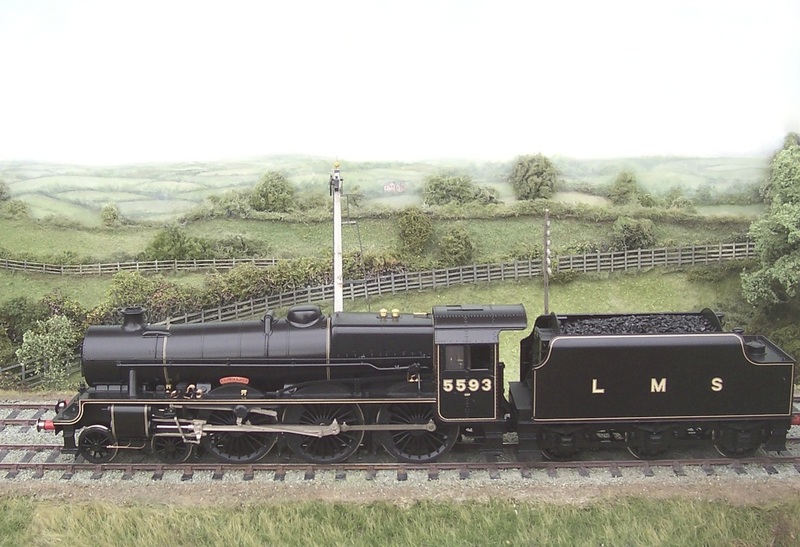 No 5593 'Kolhapur' is in the attractive L.M.S. lined black. One of a limited run from Lee Marsh. 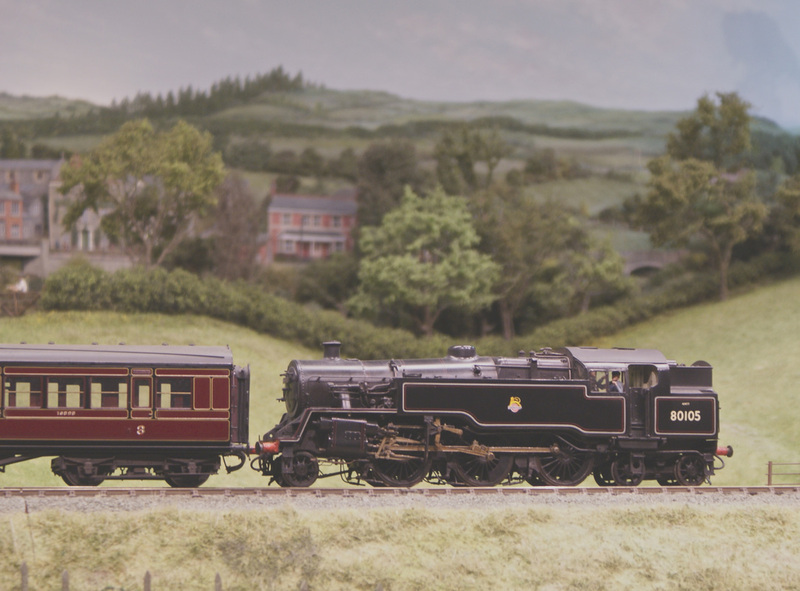 Recently built from an MOK kit, this Armstrong 4-4-0 was painted and lined by Alan Brackenborough. These were nominal renewals of four of Dean's "experimental locomotives", Nos. 7, 8, 14 and 16, thus explaining the early numbers. 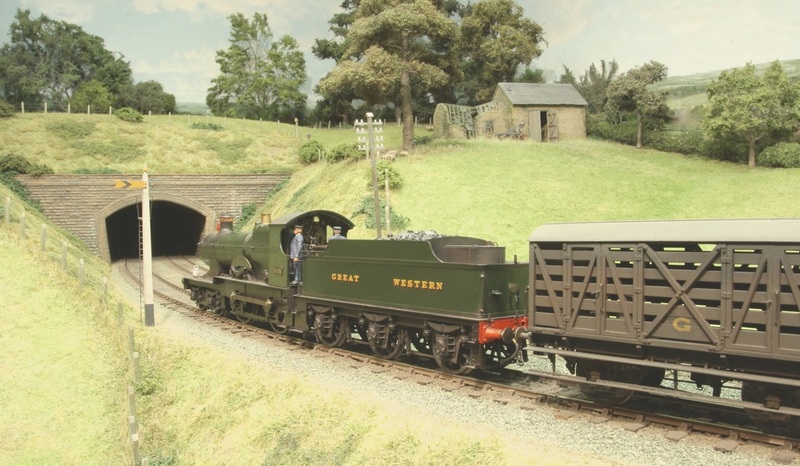 Had it not been for the recent derailing of one of his 3001 Class 2-2-2s in Box Tunnel, they would probably have been rebuilt as 2-2-2s, but the adoption of Dean bogies and double-curved running plates resulted in an exceptionally handsome design.